In between the meetings you can also use the new Big Local social network, Workplace, to keep the conversation going. After a year, we hope you’ll have been supported to achieve something great and will take the opportunity to share what you’ve learnt with other Big Locals. If you have a suggestion for a cluster, we’d love to hear it. You can email us or join the conversation on Facebook by joining the group “Working on Big Local”. 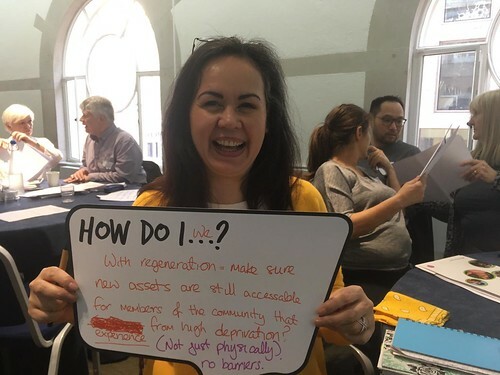 In Better Homes and Building Homes, you’ll learn how to work with key stakeholders in Local Government, the public sector and private sector to improve the quality homes in your area and enable new homes to be built. Note: this cluster is aimed at Big Locals that are near to, or have a strong connection with, the coast. There’s huge potential on the coast to build more sustainable economies that can deliver good jobs, increased wellbeing and a healthier marine environment. With NEF, which is launching the UK’s first Centre for Coastal Economies in 2018, you will explore the challenges and opportunities of your coastal Big Local. With other Big Locals with a connection to the coast, as well as other communities harnessing their unique coastal assets, you will develop a network that will support you now, and in the future. At the end of the year, you will have gained bespoke advice on economic development and coastal issues, new connections, support and inspiration to deliver exciting, enduring community projects built around thriving seaside economies. If you’re interested in joining any of the clusters, or have suggestions for another cluster, email us.